Situated in a quiet residential area of Banff, this cozy and private apartment is located at ground level of our main residence. But because of our location, you still get great mountain views!! We are conveniently situated within walking distance to all restaurants and shops. The grocery store is a 5min walk, and so is the Parks Canada Information Centre where you can buy your park pass and gather all of the information for your trip to supplement the guide books and maps we leave for our guest's use during their stay. As your hosts, we are always happy to make recommendations on places to visit and trails to hike. The apartment is fully equipped with everything to make your stay in Banff comfortable and convenient. Electric appliances include: full size stove and oven, full size fridge, quiet Miele dishwasher, microwave, coffee machine, kettle and hand mixer. For your laundry needs, there is a washer/dryer in the suite and we supply soap for your convenience. Optik TV, DVD player, land phone line for local calls, and free, secured WI-FI access. If you have large items with you, we provide a secure storage area for skis, bicycles, golf clubs or other sports toys. This is truly one of Banff's coziest, and affordable, accommodation options. We are long-time Banff residents and we are happy to cater to those who wish to spend a bit more time in Banff to truly explore the Canadian Rockies in a way that makes them feel at home ... away from home. Hotels are expensive and cooking facilities are usually very limited. For an extended stay we offer the perfect solution at an affordable price. Several times we have hosted parents who have a child working in Banff, but due to the housing restrictions, cannot offer lodging to their parents. The size of the apartment with it's full kitchen provides a great opportunity for a visiting family to connect with their loved one. The accommodations were spacious for two. We made good use of the kitchen along with the washer and drier. The location was PERFECT. It was close to town which offered many good restaurants. We enjoyed some local hiking trails. We also took advantage of park service busses to Lake Louise and Johnston Canyon. Overall we had a great time and our hosts were wonderful. Fantastic Banff location! Immaculate. Wonderful owners. We so enjoyed staying in the Alpine Suite this last week. It was very comfortable and had everything we needed, including a spacious lockable storage area for our bikes. The kitchen was very well stocked yet uncluttered with cupboards for our food and a brand new refrigerator. The Miele dishwasher was very quiet. The location cannot be beat~ the suite is two blocks from the heart of Banff and we walked everywhere from the apartment. We also did a number of bike rides right from the suite, including Lakes Minnewanka, Two Jack, Johnson, and Vermilion, Tunnel Mountain, Spray Valley, etc. At Maple Leaf restaurant, we had awesome French Onion soup and loved our Indian entrees at Masala. A special “thank you” to the owners for allowing us to be their guests in this lovely town. We will be back! Wonderful to find a rental in the central part of town where we could walk to everything. Two blocks from the Main Street, quiet, very clean with all amenities for a longer term stay. Starting with a friendly briefing on Banff and the area by Marie-Pierre, to later helpful advice from husband Gordon, our hosts were super. There is a lot to do in and around Banff and their advice steered us to the best options. The unit was spotless, the kitchen had all the pots and pans and cooking items we needed and the bed was most comfortable. The large sitting area was perfect for relaxing. It was a quiet neighborhood and the sun pours in the windows facing the garden. The location is so convenient to Town that we even did grocery shopping without the car - a definite benefit when visitors make parking hard to find. We were comfortable and could go out all day and then look forward to coming back to a lovely apartment, knowing that if we had any problems (which we didn't), they would be quickly dealt with by our hosts. We would recommend the unit to anyone and if we were coming back to Banff, that is where we would want to stay. absolutely amazing apartment very nice superbly equipped everything u could ever think of short stroll to main street bus stop around corner very quiet residental street.Amazjng scenery right on your doorstep beautiful walks lovely parks next to river.A very nice experience there in banff would stay again 100% enjoyed relaxing I. the garden as well. Perfect location and a great place to experience the Canadien Rockies! Apartment was very clean and has everything you’ll need. 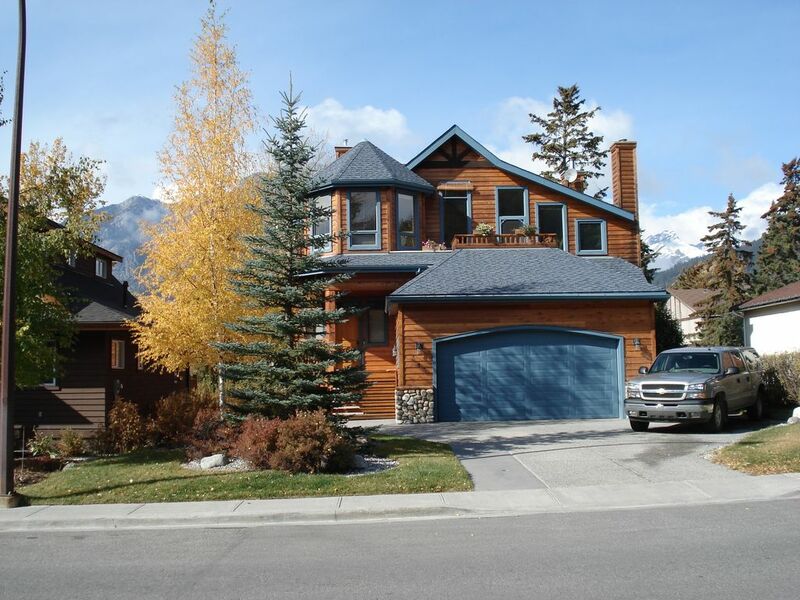 Perfect location to experience downtown Banff and easy access to route 1 to get to all the great national parks. Two ski hill shuttle stops are within a 5 to 10 min walk from the property. $1000-1300CAD / Week Minimum length of stay is 7 days and there is no partial refund for early departure. Rate based on 2 adults. For longer stays we offer discounted rates. There is $100CAD handling fee for cancelling less than 60 days prior to arrival. Because our weeks are carefully booked in advance, all payments are forfeited for cancellations made less than 60 days prior to arrival.